Another bar, another Nils Oscar and local pear cider, but this time on tap. 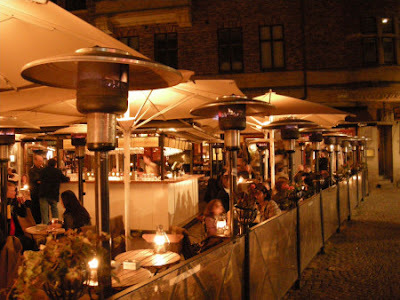 Lilla Torg (Lilla Square) is a bustling entertainment district within the city centre. We're in Sweden in the summer, so the sky is twilight at 11:00pm, and it is pleasant but chilly. All the bars seem to favour outdoor patio seating, and each chair is adorned with a quality blanket (see below). Space heaters are copious, leading one to wonder if they aren't a major contributor to Scandinavia's per capita carbon footprint. 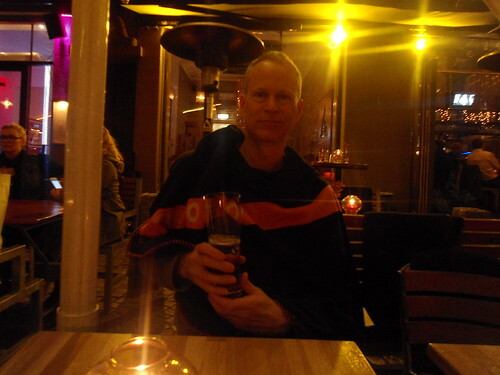 Me enjoying a lager and a blanket.